ADELAIDE United's goal-scoring hero Daniel Adlung summed up the brutality of the emphatic 2-1 FFA Cup win over Western Sydney, describing some challenges as warranting red cards. 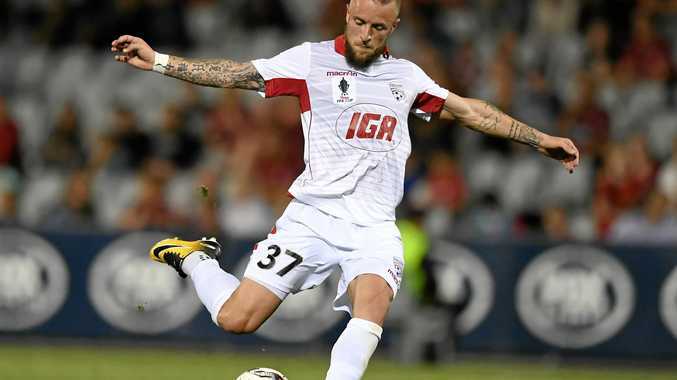 Adlung scored Adelaide's second goal with a brilliant long-range strike in the 58th minute in a game which saw referee Peter Green manage to keep 22 players on the park at all times at Campbelltown Stadium on Tuesday night. Green booked five players - three from Wanderers and Reds' Isaias and Ben Warland. Adlung, who had picked up three red cards in a career spanning more than 300 games in Germany before signing for United this season, was on the end of a questionable tackle from Álvaro Cejudo at the start of the clash. "It's always like that it's very tough, I like it like that, but in Germany tackles like that, you get a red card," Adlung, 30, told Fox Sports. "But here it's nothing, they play through (this), it's new for me." Wanderers Jacob Melling's raised double-footed challenge was perhaps the ugliest challenge of all on his former Reds teammate Jordan Elsey in the second half. It raised eyebrows but didn't even attract a caution. But Josh Risdon's scissor tackle on Adelaide's opening goal scorer Johan Absalonsen saw the Dane leave the park with a thigh injury in the 63rd minute. Roly Bonevacia catching Reds skipper Isaias with a high boot on the back of the knee in the 15th minute was another tackle bordering on a send-off according to the laws of the game. But Adlung was content with the win which now sees Adelaide march towards the final against Sydney FC on November 21 at a yet to be determined venue. It was also his first goal in a Reds shirt. "It was a good goal, sometimes I have to shoot more often so I can score more goals,'' he said. "It felt good, with a little bit of swerve and from the moment it left my foot I felt that it was going in."